A few years ago on the slopes above Meribel I bumped into some of the RAF Telemark Ski Team. They asked me if I had a light, I said no, but offered them a hip-flask full of Whisky. One of them was a medical officer and noticed my shortened fingers. She asked “are you badly injured?” I explained my situation and within minutes I was having tea with a Major and stood surrounded by people shaking their heads in disbelief. “You can’t ski telemark without toes!” they said. It sounded like the same voices that said I’d never climb again after suffering severe frostbite. It was the start of a relationship that has seen me ski with the Army Telemark Ski Association, the GB Telemark Team, lecture at Sandhurst and the Royal Citadel in England, and Rauris in Austria. My apparently simple journey to Rauris was almost thwarted by a coach breakdown, the flight being diverted from Salzburg to Munich and the train deciding not to stop at my destination, but the life of adventure travel hardly ever runs smoothly. The important bit was that deep snow was dumping on the mountain! I skied the first day with friends from the military on new skis, boots and bindings. 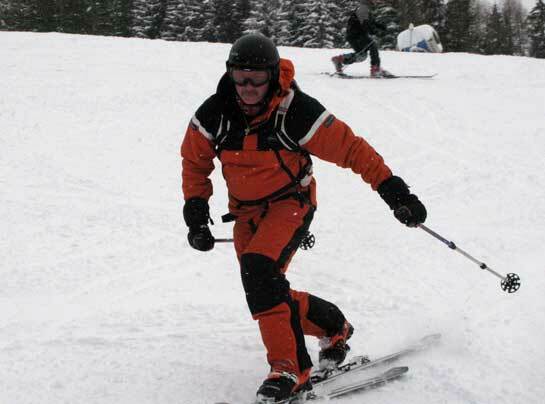 I’d decided to move from my traditional wire kit to NTN (New Telemark Norm) as many experts had advised me that it would be beneficial to me because of my injuries. I have to say it was a bit of a stab in the dark on my part, and a very expensive one at that, but you never learn by standing still. The weather seemed to be making news back home in the UK and BBC Radio Derby called me for an interview one morning as I was out skiing. The world of modern communications allows people to be in touch around the world, and I always try to be available for the media as interviews are the best PR I know. I was asked to present ‘Frostbitten – Turning Tribulation into Triumph‘ in the town hall and was greeted by a packed house. During the earlier part of the week people had been complaining about the cold and driving snow. I soon put them right with my stories of frostbite and mountaineering across the world. I’ve been doing a great deal of work in my presentations and skills as of late and it’s beginning to pay off. We must never assume that we always have everything right, or that nothing needs changing or updating.